After all the disappointment surrounding Sedaris' Squirrel Seeks Chipmunk, the literary world seemed to breathe a sigh of relief when Sedaris returned to his familiar style of witty, sarcastic essay writing. He turns again to the topics he covers best: family life, current events, and descriptions of his travels. From stories about his father and childhood to descriptions of his first colonoscopy, Sedaris takes everyday life experiences and makes them highly entertaining. As with all of Sedaris' other essay collections, I was thrilled with this. Sedaris has a unique style and he does dry humor and sarcasm particularly well. He also has a distinctly literary quality to his writing that I appreciate. I didn't hate Squirrel Seeks Chipmunk, but I did appreciate the return to what Sedaris does best. I thought this was a great addition to his essay collections and I'm glad I had the chance to read it. I had several laugh out loud moments while reading and would count this as one of the funniest books I've read so far this year. 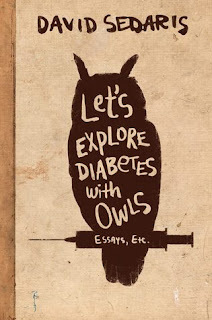 I highly recommend it, both for long-time readers of Sedaris as well as those who are new to his writing. You don't need any familiarity with his previous books to enjoy this one, and I think his sense of humor has a pretty broad appeal. My only wish is that I had listened to it on audio rather than read it as an ebook. I've found that hearing his voice adds quite a bit of enjoyment to his essays. It's good to know he's back on his game. I definitely agree about his voice, it makes his books that much more hilarious.